This weekend, Will Ferrell announced that he will be appearing on February 12th at the Moore Theatre with Mike McCready, Brandi Carlile, and Red Hot Chili Peppers' Chad Smith for an evening of stories, comedy and music. Proceeds benefit Cancer for College. One Classy Night in Seattle: Will Ferrell and friends gather for an evening of musical chit-chat, live rock-n-roll and very little cowbell. 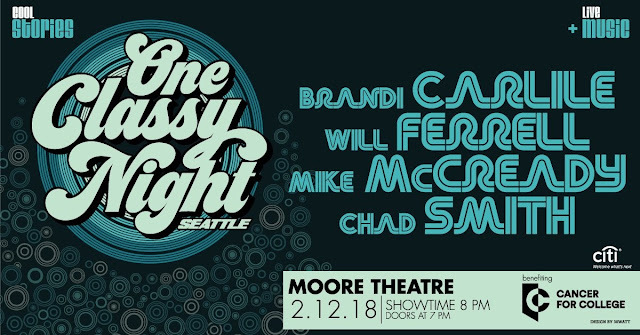 Will Ferrell and his musical pals Brandi Carlile, Mike McCready of Pearl Jam and personal doppelganger Chad Smith of Red Hot Chili Peppers will gather on stage at the historic Moore Theatre in Seattle on Monday, February 12, 2018 at the Moore Theater in Seattle for a very special musical experience benefitting Cancer For College. The audience will be invited to sit in as the group will have a lively discussion about the songs, music and performers that have shaped their careers. Expect the group to share personal anecdotes and first-hand experiences from throughout each of their incredible careers. The evening will be capped by a very special live performance from the super group as they jam through some of their favorite songs from rock-n-roll history. Sorry for the late reporting, but there are a few tickets left if you hurry!